Here’s a quick review – it was ok. 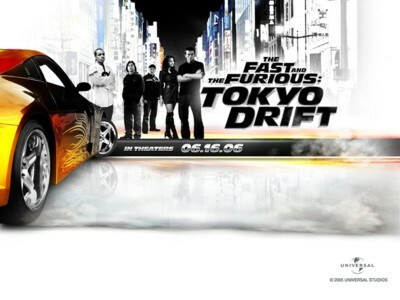 However, for a movie about fast cars being driven…um, furiously, there was a lack of car action. There are basically 3 worthwhile car race sequences: one at the beginning, one in the middle, and one at the end. The one at the beginning was good, and the middle one was the best of the three, but the last one was a letdown. The quick edit technique was overdone in that one, and as a viewer I didn’t really feel like there was anything at stake. There was CGI used for the races, and while some of it wasn’t bad, there were a few spots that were remarkably obvious. The characters and plot are nothing to right home about, and the back of the DVD case will probably pretty much cover it. Basically a 'strike three' California teen gets sent to Japan to live with his father instead of to jail. There he gets involved with the Yakuza and tries to drift. Things happen to people, and he decides to step up and take resposiblility. That's about it. Lucas Black, the lead, has a southern accent that gets hard to listen to after a while. He’s serviceable in the role, but he’s no Vin Diesel. The first F&F was somehow a decent and entertaining flick. The second was over the top, but fun in its stupidity. This third one tries to be both a car action movie with a serious ‘rebel takes responsibility’ story and doesn’t quite do either well. The best part of the movie comes at the very, very end. I won’t spoil it here, but put it this way – as the cars peel out and then the credits roll, I’m sitting there thinking that’s a race and story I wouldn’t mind watching where it went. Too bad the movie didn’t start there. Comments on "Me Mini Movie Reviews - Fast & Furious: Tokyo Drift"
I'm with you. I had a good time with the first one, totally skipped the second and this one was only fun because I saw it with a routy loud group that WANTED to have a good time. Yeah, it was ok, and setting it in Japan was an interesting angle. But for a movie about driving cars fast, I've seen better skill and action in an episode of The Rockford Files - with no CGI!